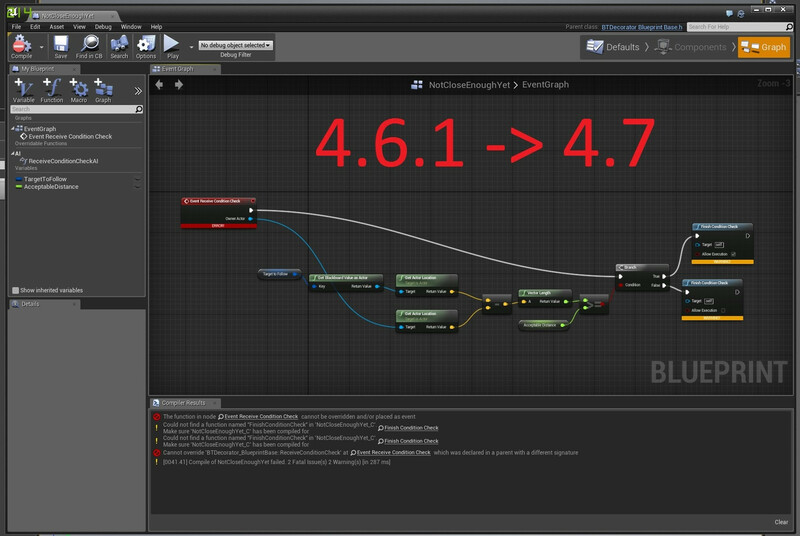 I am using a relatively large BP project see ( https://forums.unrealengine.com/showthread.php?53208-MMO-Starter-Kit ) . 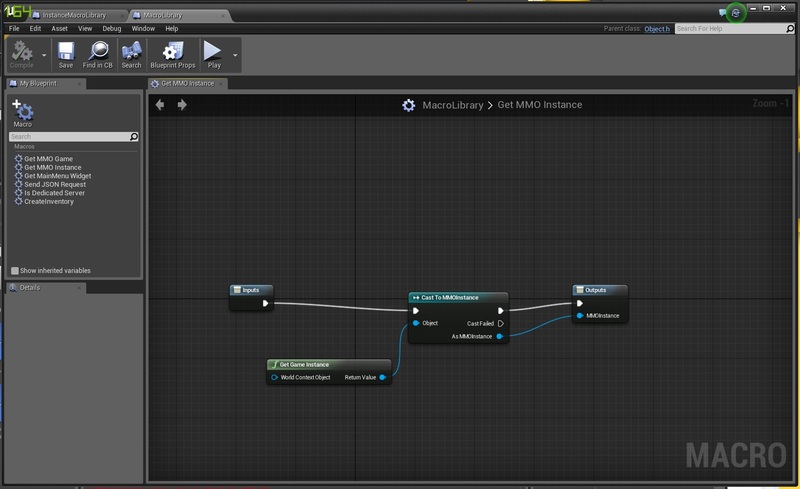 I've tried debugging the editor, after the editor breaks, trying to figure out which node is causing it, but the heirarchy is pretty complex. Are you receiving any specific errors when it crashes? Additionally can you post your crash logs located at \Unreal Projects\PROJECTNAME\saved\logs\? Does the editor have any output errors that you receive before it crashes? For instance are you getting any "access 'None'" errors? Try removing your folders containing blueprints out of the editor to open it. Then start adding these folders back into their correct filepath until the crash occurs. It looks like a casting crash that isn't finding a specific blueprint that it is trying to access. Hey adam, I think i found the issue / another (unrelated bug?). Meant to post it here but its down below. I get a nice deprecated warning so that will be helpful for others! I think i've tracked it down to a bug with Blueprint Macro Libraries. The original crash seems to all come down to my Custom Game Instance. I am using a macro that basicaly just gets the game instance, and cast to my custom game instance. Here are the two (seperate bugs?) . I had a BP-Object macro library. Throughout my project, I want to get a reference to my custom game instance so i made a macro. In 4.6.1 http://i.imgur.com/R0WrZNu.jpg it looks like this. You can't do this in 4.7 ? Context bug? 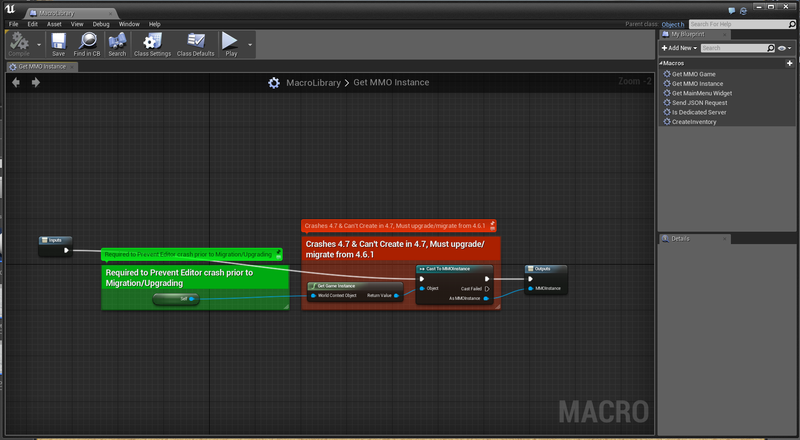 Migrated it to my 4.7 project, changed the basic macro (from above) into one that looked like the original. I have no idea if the old macro library became corrupted? Circular dependency? I still have a few random small errors/not working as intended bugs, but that comes with every new big release. The project runs, and is 97% working like it was so thats good :) but its strange, if the blueprint teams wants, i can forward a copy of the project (from 4.6.1) so they can better investigate. Did you happen to change the name of the macro from the original name? There seems to be a potential bug with macros that is preventing the macro from being accessed if it is not the original name given to the macro library. For instance, if it was created and called "NewMacro_0" but immediately renamed to "TestMacro". The macro would not be called unless you used "NewMacro_0". I have entered a bug report for this as UE-7948. Can you check to see if this helps with your crash? As far as the original problem it doesn't to fix it. Are we still suppose to be able to Get Game Instance in Macros in 4.7 (cause can't anymore)? Can you post a screenshot of your macro calling the game instance? I might be able to see what is going on with that. I can't call "get game instance" in 4.7? so it being valid (in 4.6.1) then migrated might be causing the crash? I'm in process of creating a simple example that makes it reproducible. But either way the editor not failing safely. 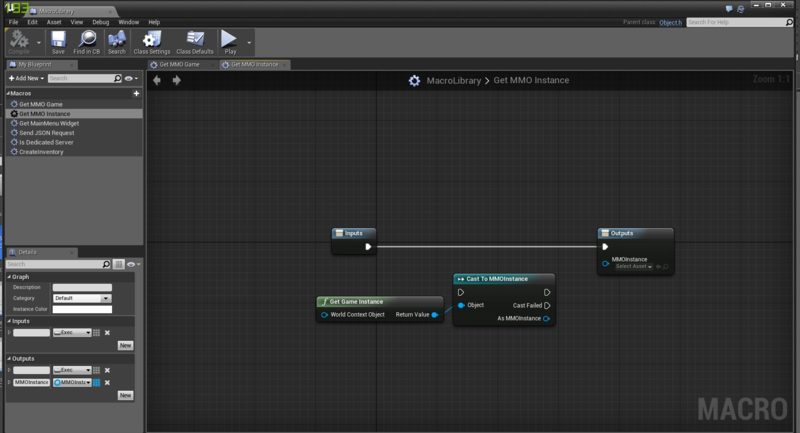 Cast to game instance as in your picture labeled "Before"
Call this macro in some other blueprint, compile save close. 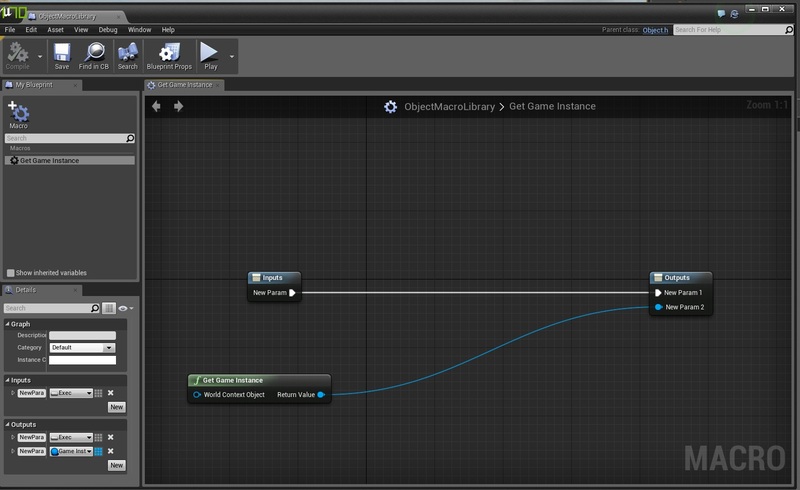 Add copy of blueprint to level, save and close editor. At this point the editor should crash. Are there any steps that I am missing or do not need to take in the above list? Is there any updated regarding this issue? I'm getting crash on startup with very similar macro library as KRushin's example. Once I delete the library the editor runs but I'll have to fix all other blueprints using anything from that macro library. Are the steps I provided above the steps you are taking that cause the editor to crash? Can you post your logs here so we can take a look?